Thank you so much for the camp scholarship so I could go to the camp sunrise at camp Warwick. I had an awesome time. I loved swimming in the pool on the hot summer days. The counselors were very nice, a lot of fun, and helpful. I made lots of new friends at camp. We had fun hanging out with each of them in the pool. We also had a talent show and a dance. Camp is so much fun. 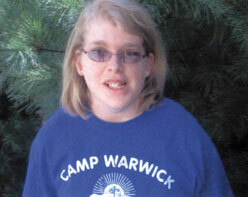 I like going to camp because I can be independent and take care of myself. I also like to get away from my family and meeting new friends. - What the Life Link Support Group Means to Me!